Being comfortable is important, especially on my days off. Also, lately I have been into slightly sporty looks. This outfit would be something I would definitely wear when not at work. It is comfy plus I would not be embarrassed to be seen in public in it. I love the zipper details on these joggers. A sassy red lip and simple jewelry sets off the outfit and makes it just girly enough to fit into my style. Super cool outfit atfor a very affordable price!!! Those pants look like Heaven right now! Love the tank and necklace you paired with them! Loving everything about this outfit!! I'd wear it all!! Love this- those trousers are perfect! I love this look. They have similar joggers at H&M right now. I regret not scooping them up. i almost got a pair of similar pants. love the look you put together. Love that tank. It looks so comfy, but still cute! 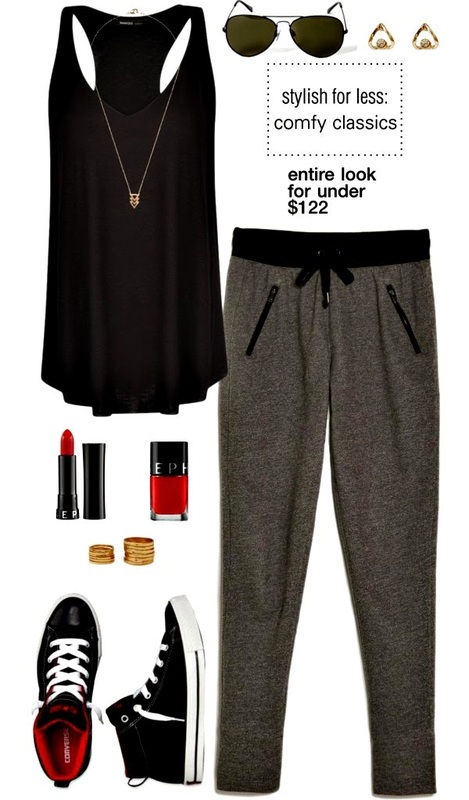 LOL - I have the H&M version of those pants - they are so comfy and my go-to! Those sneakers are fabulous! Adore.